How do I enable anonymous instructor annotations in student submissions? When creating an assignment, you can enable anonymous instructor annotations in DocViewer supported submissions. When students view a submission with anonymous instructor annotations in DocViewer, comments do not display an instructor's name. This option only affects comments added in DocViewer in the SpeedGrader submission window. Comments added in the Speedgrader sidebar are not anonymous. Anonymous instructor annotations is currently a course opt-in feature. To enable this feature, learn how to manage feature options in the course features lesson. Anonymous Instructor Annotations is not associated with the Anonymous Grading feature and displays as an option in all assignments. If you select this checkbox after student submissions are received, any annotations already made in DocViewer will not be anonymous. Ensure this checkbox is selected before allowing students to submit assignments. To open an existing assignment, click the Assignment name . 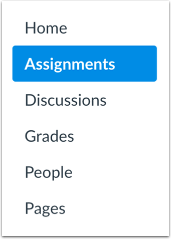 To create a new assignment, click the Add Assignment button . Select the Anonymous Instructor Annotations checkbox. If you want to notify users about any future assignment changes, click the Notify users that this content has changed checkbox . Click the Save button . Note: If your assignment has not yet been published, the assignment will show the Save & Publish button . The Save button will create a draft of your assignment so you can publish it later. Previous Topic:How do I add an assignment that includes anonymous grading? Next Topic:How do I add a moderated assignment to be graded by multiple reviewers? Table of Contents > Assignments > How do I enable anonymous instructor annotations in student submissions?